Date and time: Sunday, March 2 at 7:30 p.m. The Goshen College Women’s World Music Choir will conclude their spring break tour to Pennsylvania with a “home concert” in the Music Center’s Sauder Concert Hall on Sunday, March 2, 2014 at 7:30 p.m. The choir will perform songs in 10 different languages and from places such as Yemen, Iraq, New Zealand, Mali, South Africa, Spain, Russia, the American South and Appalachia. There will be several opportunities during the program for the audience to join the choir in song. 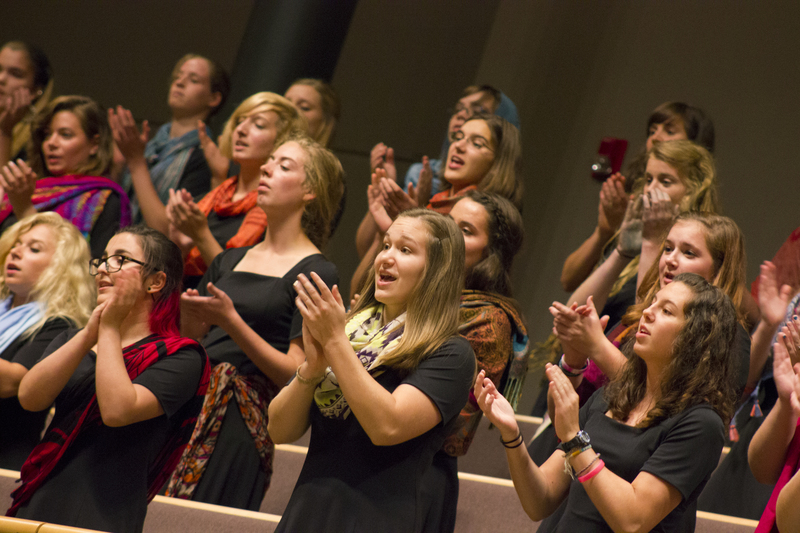 “Many of the songs in the tour’s repertoire celebrate the community created by women at important times in their lives – sung lullabies, marriage, standing up for one’s own individuality, recognizing the strength in the community of sisters surrounding them,” said Deb Brubaker, professor of music and director of the Women’s World Music Choir. 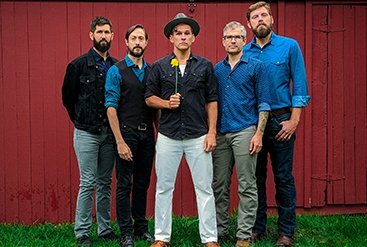 The concert is free and open to the public, though a free-will offering will be held to help cover tour costs. 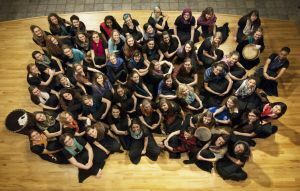 The Goshen College Women’s World Music Choir was formed in the spring of 2004. Its goals are to discover and perform music of many cultures, both national and international, particularly indigenous cultures. The choir also serves to highlight the role of women in these cultures, celebrating the unique spirit and energy that women bring to the world as creators, sustainers and disrupters of life and culture. The choir features the following members: (Soprano I) Anika Baumgartner, Breanna Bloom, Prashansa Dickson, Miranda Earnhart, Kate Friesen, Maddie Gerig, Emily Grimes, Sadie Gustafson-Zook, Christina Hofer, Sara Klassen, Olivia Ressler and Sarah Toews; (Soprano II) Hannah Bachman, Brianne Brenneman, Brynn Godshall, Cecilia Lapp Stoltzfus, Emma Koop Liechty, Drea Mast, Rachel Mast, Alisa Murray, Cara Paden, Dona Park, Becky Snider and Halle Steingass; (Alto I) Emma Caskey, Dominique Chew, Annette Conrad, Katrina Evans, Naomi Gross, Laura Hochstetler, Sarah Hofkamp, Katie McKinnell, Kelly Miller, Malinda Slabaugh, Sam Weaver, Emily Vogt and Ardy Woodward; (Alto II) Ellen Conrad, Jieun Han, Mary Hiebert-White, Laura Miller, Anna Nafziger, Morgan Short, Grace Weaver, Maggie Weaver, Elizabeth Woodworth and Madeleine Yoder. Brubaker holds a doctorate in musical arts from the University of Kansas, a master’s degree in music from the University of Northern Colorado and a bachelor’s degree in music education from Goshen College. She was assistant professor of music at Bluffton (Ohio) University for 10 years and has taught choir in public schools in Indiana and Colorado. Since coming to Goshen in 1999, Brubaker has directed the Goshen College Chorale and Chamber Choir, and in 2004 created the Women’s World Music Choir, which performed at the 2008 central division conference of the American Choral Directors Association in Grand Rapids, Mich. 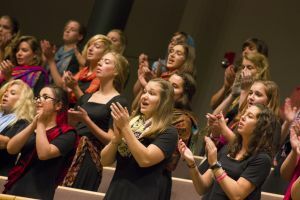 The Goshen College Music Department offers a bachelor of arts degree with concentrations in music education, performance, piano pedagogy and music in worship. 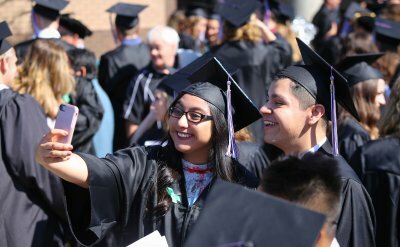 Seventy-five students major or minor in music and enjoy participation in five choirs, staged musicals and operas, orchestra, wind ensemble and jazz band. The music department is housed in the Goshen College Music Center, built in 2001. The Music Center features the 1,000-seat Sauder Concert Hall, the 300-seat Rieth Recital Hall, rehearsal and practice rooms, classrooms, teaching studios, a recording studio and an art gallery. The Community School of the Arts, located in the Music Center, provides teaching experience and leadership training for Goshen College students. 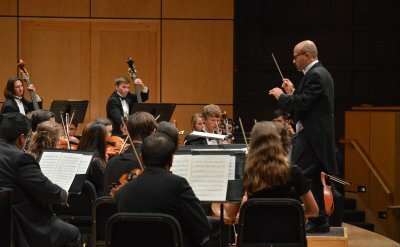 The Performing Arts Series regularly brings prominent national and international musicians to the Music Center.